20,000 Volunteers Honoring and Supporting Our Military including US NAVY Participation at USS FORRESTAL Headstone. 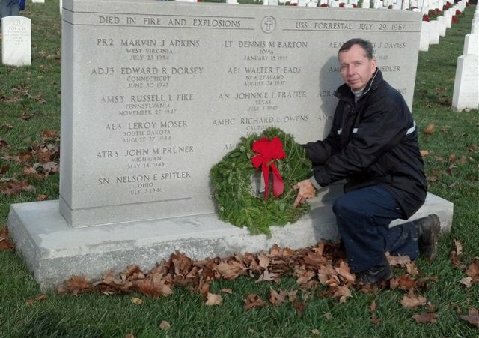 USS FORRESTAL WestPac 67 RVAH-11 Shipmate and now Retired U.S. Army Colonel Emmett O'Hare participated as one of the area supervisors for the placement of Christmas wreaths at Arlington Cemetery. He made sure the Forrestal Crew received a wreath, then he found a group of young sailors to make a formal wreath laying at the grave site. You have all been in the military or have been involved with military families. This should make you very proud to know of the support being furnished to our military by everyday citizens. They came from around the country to Arlington National Cemetery to honor our deceased service members interred there. 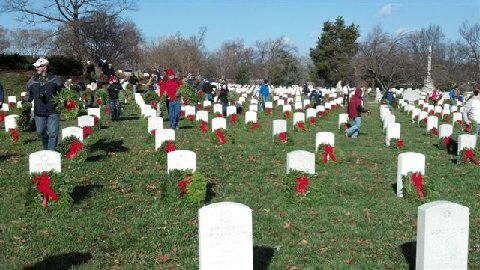 These photos show only a small portion of the tremendous outpouring of support by more than 20,000 volunteers who were on hand to honor our deceased veterans by placing wreaths on their graves. 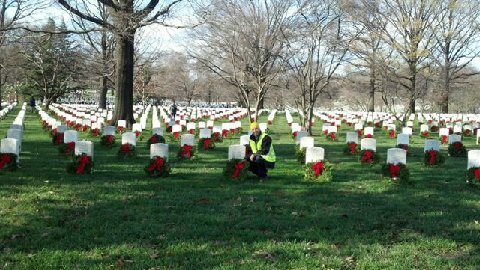 Please go to Wreaths Across America's website to see many more photos. I had the privilege of managing one of the sections, and had been advised that I would have approximately 150 to 200 volunteers. What a wonderful surprise when my group swelled to over 2,000 people from all walks of life, military, veterans, scouts, and many groups and families who said they simply felt a need to show their support for our military. That same increase occurred at each of the areas designated to receive the wreaths. What really was heartwarming was to see parents helping their children place a wreath, and then explain that the soldier had given his life for our country so it could be a better and safer place for the children. I was very proud to have participated in this event, and want you to know that I represented each and every one of you who were not able to be there. This is a great gift for Christmas for all military personnel and veterans. Col. Emmett O'Hare, USA, Ret.